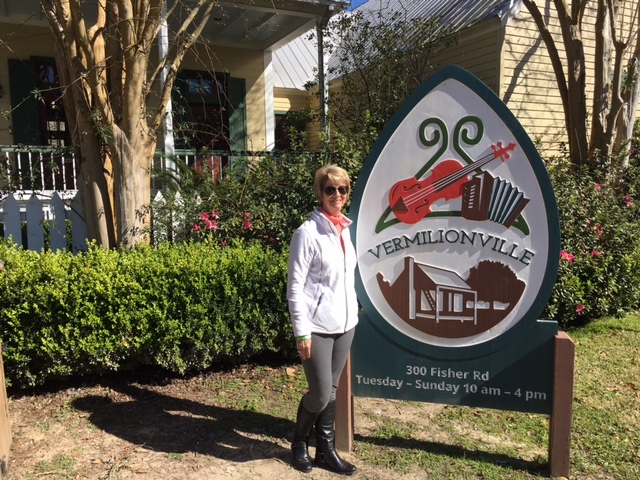 Vermilionville – Let's Go RVing! We had several things we wanted to do today since we took off yesterday to get clothes washed and do just general housekeeping and quite frankly to take a break from touring. That meant we got out about 10:30 which seems to be the norm for us no matter what time we get up in the morning. Our first stop was Best Buy in Lafayette where we bought a new selfie stick since our other one broke. This one has a remote so it should be easier to operate than the older one. We rode down to The Cathedral of St. John the Evangelist and started to go in but realized that there was a service going on so we quickly exited. Next we headed to Vermilionville, a living history museum and folk life park opened in 1990. It sits on the bank of the Vermilion River at one time the dirtiest river in America but now thanks to a group of people it is now much cleaner and people can even swim in it at certain times. There are also some edible fish in it. The village has several houses on the grounds, some of them authentic and some reproductions. In the schoolhouse there was a gentleman playing the accordion and talking about days gone by. We went into another house where a lady was quilting. This was an updated home that actually had plumbing that was added some years after it was built. A framed wreath was hanging on the wall and the guide explained that because the wreath was opened at the top it indicated that the person for whom it was made was still living at that time. It possibly could have been done in honor of a daughter who had joined a convent and thus would no longer be seen by them. Had the wreath been closed at the top it would have indicated that the wreath was made in memory of someone. There was a thick tress of hair in the middle and then around the edge were woven strands of hair. Quite frankly it was a little spooky! There were other demonstrations going on throughout the day but because we were there at lunch we missed some of them. One was a wood carver and I think Jerry might have enjoyed seeing him carve his ducks. There was a small lake on the property and it had a pulley ferry that could be used to cross to the other side. We got on and Jerry started pulling on it but quickly noticed that the rope that had been lying in the water was mossy so he decided not to continue to the other side. It was way past lunch by that time so we headed for the Villager Café in Maurice, another recommendation from the Happy Hour crowd. When we walked in we saw a couple from the park. I really didn’t expect to see someone I knew when we entered! We ordered poor boys and though they were good the best thing was the bread. It was some type of French Bread and was crusty and delicious! 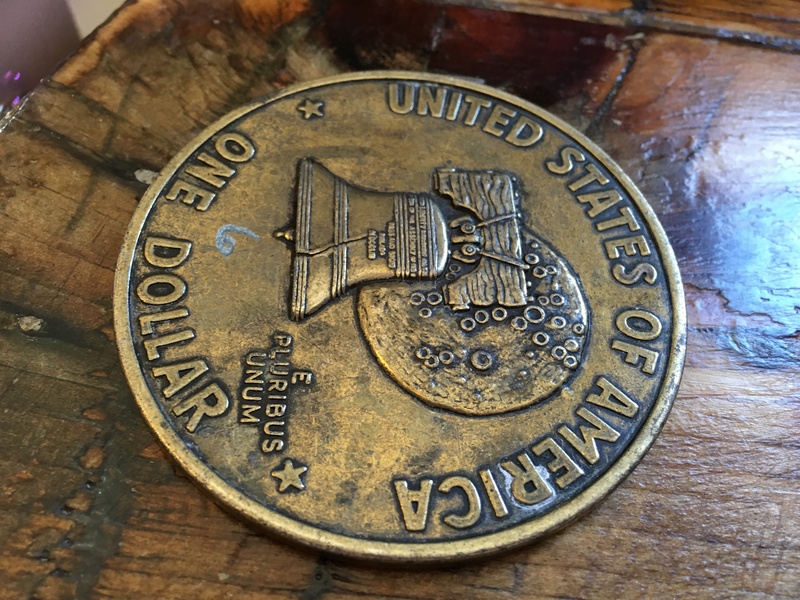 When the waitress brought us our bill she just placed a large coin on the table. We were a bit mystified until Jerry realized that there was a number 6 on the coin and 6 tables in the restaurant indicating that our bill was for table 6. I talked Jerry into going to Hebert’s to look at the specialty meats. We didn’t buy any but I wouldn’t be surprised if we make a return visit. We headed on to the park and as soon as we parked the car and I reached for my purse I realized that it was hanging on the chair at the table we ate at in the Villager. A quick phone call to the Villager and they assured me that it was still hanging right there so we turned around and went back to Maurice. As soon as we got back we got our chips and dip and headed over to the Happy Hour. After a fun time with everyone we came on back and settled in for the night. Previous postTabasco Sauce and Rice! Thanks so much! We are having a ball traveling through Louisiana!